Regardless of how intelligent they are, people with developmental dyslexia have difficulties in learning to read, a characteristic first described over a century ago1. Dyslexia is now known to be a hereditary neurological disorder that affects a huge number of people  about 5% of the global population  but its underlying basis is still hotly debated. At two recent meetings*, however, the reasons for the disagreement became clearer. The prevailing view of dyslexia involves the idea that learning an alphabetic writing system requires the brain to map letters to mental representations of the corresponding basic speech sounds (phonemes). The phonological-deficit hypothesis (Fig. 1a) holds that people with dyslexia have specific problems in representing or recalling those sounds  hence the problems with mapping them onto letters. The theory is supported by observations that people with dyslexia have difficulty retaining speech in short-term memory, and consciously segmenting it into phonemes (for example, deleting or substituting phonemes from words)2. But this view  that the cognitive basis of dyslexia is purely phonological  has been challenged by the discovery that people with this disorder also have an array of subtle sensory defects. For example, they fare less well than control subjects in several auditory tasks that require the perception of brief or rapid speech and non-speech sounds3. They also seem to have difficulties with several visual tasks, such as those that involve the perception of motion4. Moreover, there is evidence that the brains of some dyslexics have subtle neurological abnormalities in certain areas of the visual and auditory systems  the so-called magnocellular pathways5. Researchers who support the magnocellullar theory (Fig. 1b) do not dispute the phonological-deficit hypothesis. Rather they contend that phonological problems are caused by a basic deficiency in hearing sounds and that a visual deficit might independently contribute to reading problems. But the magnocellular theory is itself now facing criticism. In several studies, auditory processing has not been found to be impaired6,7. Although groups of people with dyslexia and control groups sometimes show significant differences in both visual tasks (J. Stein, J. Talcott, Univ. Oxford. ; K. Pammer, Univ. Newcastle) and auditory tasks (P. Tallal, Rutgers Univ. ; C. Witton, Univ. Oxford), it is becoming apparent that these group effects result from only a minority (typically one-third) of the dyslexic participants. The remaining two-thirds fare normally (S. Rosen, Univ. College London). Other teams have failed to find significant differences between dyslexic and control groups, but usually discover a few people in the dyslexic group who do have sensory defects (Y. Griffiths, M. Snowling, Univ. York; S. Heath, Univ. Western Australia; M. Van Ingelghem, KU Leuven; S. Amitay, Hebrew Univ. Jerusalem). So, although most studies have shown that some dyslexic people have sensory deficits, the prevalence and significance of such deficits remain uncertain. One consideration is the tasks used to investigate these defects. Given that attention and general cognitive abilities are involved in sensory tasks, it is unsurprising that differences in auditory and visual processing can sometimes be explained by differences in non-verbal intelligence (M. Ahissar, K. Banai, Hebrew Univ. Jerusalem). Likewise, verbal skills  such as verbal short-term memory  may influence performance. A typical task requires a person to judge the order of events: two, three or four stimuli are presented one after the other, and the subject must recall the order of the stimuli, or say which was different from the others. Clearly, this task requires storing the stimuli in short-term memory, which might involve a verbal strategy; subjects might mentally rehearse the words high, low to help them remember that they heard a high tone followed by a low tone. Yet many people with dyslexia also have problems with verbal short-term memory  a characteristic of the phonological deficit. Indeed, when people are explicitly instructed to use a verbal strategy in this task, control subjects fare better than before whereas dyslexics perform more poorly (C. Marshall, Univ. York). Similarly, dyslexics have difficulty in discriminating between some visual stimuli when presented sequentially, but not when presented simultaneously (G. Ben Yehuda, Hebrew Univ. Jerusalem). Perhaps, then, the presumed sensory deficits actually reflect strategic differences. Even when sensory deficits are found, they do not always appear in the ways predicted by the magnocellular theory. For instance, the magnocellular visual pathway is most sensitive to stimuli of low spatial frequencies, presented under low lighting and at low contrast. So one would predict visual defects in dyslexics to be most apparent under these conditions. Yet people with dyslexia typically fare worse than controls at all spatial frequencies8 (G. Ben Yehuda), as well as at tasks in which frequencies are not entirely controlled and contrast and lighting are high (M. Bradshaw, Univ. Surrey; J. Van Ingelghem). Similarly, the theory predicts that the auditory impairment will be limited to rapid or brief sounds, but dyslexics seem to be normal on certain fast frequency transitions9-10 and impaired on certain slow transitions 11. At best, the implication is that the magnocellular theory needs some revision. More worrying is that there is little evidence for a link between these simple sensory deficits on the one hand and phonology and reading on the other. Indeed, no magnocellular deficit has been found in people who have a reading impairment as a result of visual stress (e.g., eye strain and perceptual distortions) (A. Wilkins, Univ. Essex). Similarly, performance in auditory tasks does not seem to predict performance in speech processing (C. Watson, Indiana Univ. ; C. Marshall). Moreover, a study of twins showed that phonological impairments are highly heritable, whereas auditory deficits are more likely to be due to environmental factors12. Of course, since the auditory system is a major source of input to the phonological system, any auditory defects are likely to affect phonological processing (M. Merzenich, Univ. California, San Francisco). But the question here is whether the auditory deficit suffered by some dyslexics is of the type and magnitude to cause the kind of phonological deficit that in turn causes a reading impairment. Could there be a hidden factor that might explain why the incidence and manifestation of sensory deficits vary so much across studies? One such factor may be the presence of other developmental disorders in the dyslexic population. Indeed, a significant number of dyslexics have, on top of dyslexia, specific language impairment or attention deficit disorder. There is a growing suspicion that sensory deficits might be found only in these people6 (G. McArthur, Univ. Oxford; my own data). The implication is that groups of people with pure dyslexia might be most relevant to understanding the causes of the reading impairment. Finally, the phonological-deficit theory also requires further investigation. Indeed, the greatest challenge is still to try to understand the precise nature of the phonological deficit and its biological cause. 1. Pringle-Morgan, W. British Medical Journal 2, 1378 (1896). 2. Snowling, M. J. Dyslexia (Blackwell, Oxford, 2000). 3. Tallal, P., Miller, S. & Fitch, R. H. Ann. NY Acad. Sci. 682, 2747 (1993). 4. Stein, J. & Walsh, V. Trends Neurosci. 20, 147152 (1997). 5. Galaburda, A. & Livingstone, M. Ann. NY Acad. Sci. 682, 7082 (1993). 6. Heath, S. M., Hogben, J. H. & Clark, C. D. J. Child Psychol. Psychiatry 40, 637647 (1999). 7. Hill, N. I., Bailey, P. J., Griffiths, Y. M. & Snowling, M. J. J. Acoust. Soc. Am. 106, L53L58 (1999). 8. Skottun, B. C. Vision Res. 40, 111127 (2000). 9. Mody, M., Studdert-Kennedy, M. & Brady, S. J. Exp. Child Psychol. 64, 199231 (1997). 10. Rosen, S. & Manganari, E. J. Speech Lang. Hear. Res. (in the press). 11. Witton, C. et al. Curr. Biol. 8, 791797 (1998). 12. Bishop, D.V. et al. J. Speech Lang. Hear. Res. 42, 155168 (1999). Figure 1 The phonological and magnocellular explanations for dyslexia. Ovals represent impairments at the neurological (pink), cognitive (green) or behavioural (blue) levels; arrows represent causal connections. a, The phonological theory holds that the core cognitive deficit lies in the ability to represent or recall speech sounds (phonological representations). This results in defects in mentally mapping letters to phonemes, and leads to reading impairments and problems with phonological tasks (such as splitting words up into their phonemes). The neurological basis for the phonological deficit, however, is unknown yet. b, The magnocellular theory is based on the division of the visual system into two neuronal pathways, the magnocellular and parvocellular pathways. This theory holds that the magnocellular system is abnormal in people with dyslexia, causing difficulties in some aspects of visual perception and in binocular control that may cause a reading impairment. 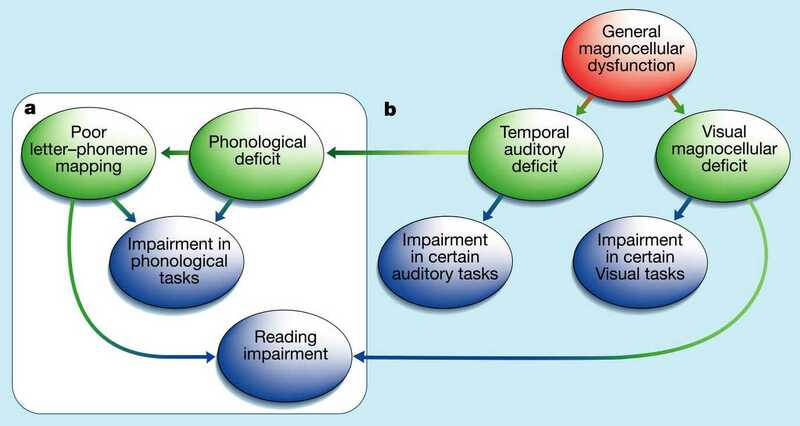 In addition, similar impairments in the auditory system are suggested to cause a deficit in processing the rapid temporal properties of sounds, leading to the phonological deficit.